The Hanney History Group meet at 8pm on the fourth Tuesday of every month from September to April in the Old Hanney Room of the Hanney War Memorial Hall. Meetings usually conclude by 10.00 pm. In the summer months they have site visits to places of historical or archaeological interest. Visitors are always very welcome to meetings and visits. There is a small charge for attending an evening meeting of £2 but the annual subscription is still only £8.00 so it often makes more sense to join for our seven or eight meetings. For more information contact Bill Orson on w.orson@btopenworld.com or 01235 868859 or just turn up on a Tuesday. In 2009, a metal-detector find of a rare garnet-inlaid composite disc brooch at West Hanney, Oxfordshire, led to the excavation of an apparently isolated female burial sited in a prominent position overlooking the Ock valley. The burial dates to the middle decades of the seventh century, a period of rapid socio-political development in a region, which formed the early heartland of the Anglo-Saxon kingdom of Wessex. The Hanney Brooch belongs to a select group of 19 other composite disc brooches of which 13 have been found in Anglo-Saxon graves in Kent. 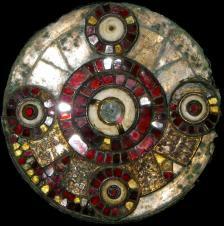 They constitute an elaborate form of the more ordinary disc brooches, which were widely worn as an emulation of Frankish fashion. The Hanney burial as well as the brooch is presented in detail in a recent article. for more information, see www.medievalhistories.com.